On Wednesday, August 22nd, 2018 there will be an Open Tent Meeting (facilitated listening session) from 9:00 am to 11:30 am in Vail at the Hotel Talisa. 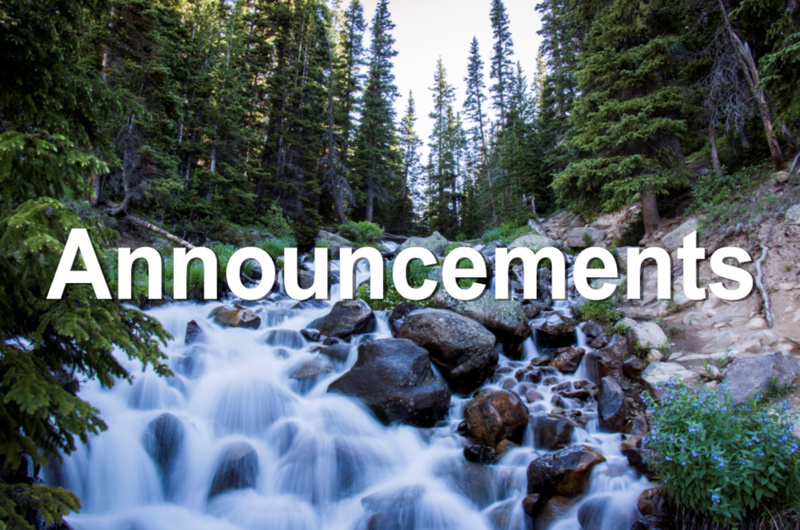 The invitation is to all Colorado entities working on watershed protection, forest health, and wildfire issues. Forest wildfires pose a continuing threat to Colorado's environment, economy, and water supply. The time has come to take a very serious look at current forest management practices and work to expand programs for watershed protection/forest health. Five entities with considerable advocacy experience are exploring the creation of an alliance to increase the level of advocacy for watershed protection and forest health. They are: Club 20, Colorado Ag Water Alliance, Colorado Water Congress, Colorado Timber Industry Association and The Nature Conservancy. They are at the conceptual stage and have not yet finalized a mission statement or work plan and seek your input as to how they might act to reinforce your mission. Your involvement is critical as they develop a detailed work plan for presentation by mid-October. If created, the alliance would not act as an umbrella group representing, controlling, or coordinating the work of local watershed entities. Further details will be announced soon. If you need immediate information, please contact Doug Kemper at doug@cowatercongress.org. Metropolitan State University of Denver is offering a new Water Studies Online Certificate, mainly in response to the reality of declining water resources. From lifelong learners who want to know more about water preservation to those working in green and sustainable professions, this unique certificate provides introductory level training and skills relevant to a wide range of fields in the nonprofit, corporate, and public sectors, including water industries, conservation, agriculture, construction, engineering, and law. For more information, click HERE. Courses open September 4th. The Arkansas Basin Roundtable has a vacancy for a voting member: At-Large Environmental Representative. Candidates must be nominated by an organization rather than by self-nomination. Please send a letter with name, contact information, and a brief description of your nominee that includes their qualifications and why you think they would be a good fit for this position. A longer letter is acceptable, but please include a one-paragraph description that can be used prior to the voting process. Nominations will be accepted through September 15th, and the new representative will be selected at the October roundtable meeting. More details can be found at http://www.arkansasbasin.com/. AUGUST 6th, 2018: Reclaimed Water - Regulation 84 Hearing Hosted by Colorado Water Quality Control Division. A public hearing is being held to review proposed regulatory changes to Reclaimed Water Control Regulation 84. For more details about other WQCC Rule-making Proceeding, click HERE. MEETING NOTICE: Colorado Water Quality Forum 10-year water quality roadmap Workgroup involvement opportunity. The mission of the workgroup is to achieve solutions to Colorado water quality issues through communication and understanding, balancing use, and protection of the resource. Water Quality Members and Participants: The 10-year water quality roadmap is their plan to develop or revise water quality standards from 2017 to 2027. They'll hold quarterly workgroup meetings to discuss progress and encourage participation. Learn more about all the topics involved on the roadmap webpage, ROAD WEBPAGE.